'Pretty Little Liars' Fashion MVP: Who Was Best Dressed in "Thrown From the Ride?" Well, this was quite the week of fashion on Pretty Little Liars. Stylish outfits are always a given, but trendy outfits by the dozen? It doesn't happen every week — in fact, there were so many perfect ensembles in "Thrown from the Ride" (yes, the episode was as tumultuous as its title would suggest) that I actually had a hard time choosing my favorite. 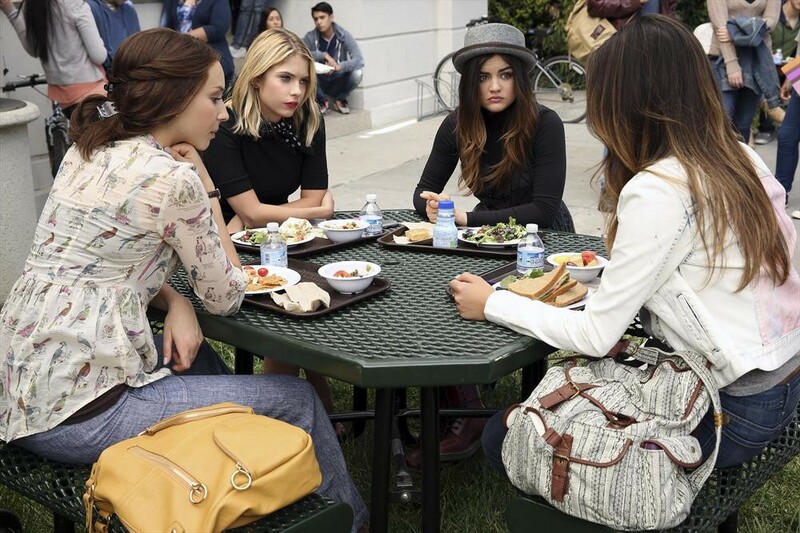 Even in the image above, it's a tough decision: Spencer's bird-printed tunic is lovely, Hanna's polka-dotted neckerchief is beyond adorable, Emily is rocking that white denim jacket, and I'm honestly kind of obsessed with Aria's tweed pork pie/boater hat hybrid (seriously, who would have thought something like that would even exist? Only the ever-avant garde Aria could pull it off). Aria's black-on-black turtleneck and jumper combo (with a handy assist from that very Aria-esque headwear) almost won me over, but in the end, I had to give it to Hanna. Her adorable identity crisis-induced black-streaked razored bob and bright berry lipstick edged up her preppy black three-quarter length sleeve blouse/polka dot scarf ensemble into perfection. The fact that she referred to herself and the girls as "lobsters in a tank at a restaurant" and casually referenced bonking someone on the head with a dodgeball certainly didn't hurt her case, either. You keep bringing that comic relief, Hanna. The rest of the pretty little liars could use some levity right now. Runner up: Hanna's shoplifted, crushed velvet crop top! It's sad that Ali's return has shaken Hanna back into old bad habits, but there's no denying her fabulous sense of style remains a constant.